It’s the month of my birthday, which is a date near the midpoint between the North’s winter solstice and spring equinox — or between the longest Night and when Day holds equal time. While Northern nights still are longer, each day is a steady gain in the solar plane. And while snow keeps falling here in Michigan, I know in the mornings I hear more bird song when shoveling my drive. This is a cusp time; the promise of a new season shines in the bright white of snow banks. In this 39th year of my life, I’m grateful for the lessons of seasons past and those to come. I anticipate this year of re-entering public work to bring uplift and challenge, alongside those of you who may join me on these occasions. Hearing about your inspirations always has given me courage and will continue to inspire me further along my own journey. Thanks to those who let me know, even in the slightest way, how these occasions may impact you. * Tonight, Thursday, February 6, at 7:30pm at the independent bookstore Bookbug, 3019 Oakland Dr., Kalamazoo. I am the sole reader for Dear Sister: Letters from Survivors of Sexual Violence, an anthology with more than 50 contributors. 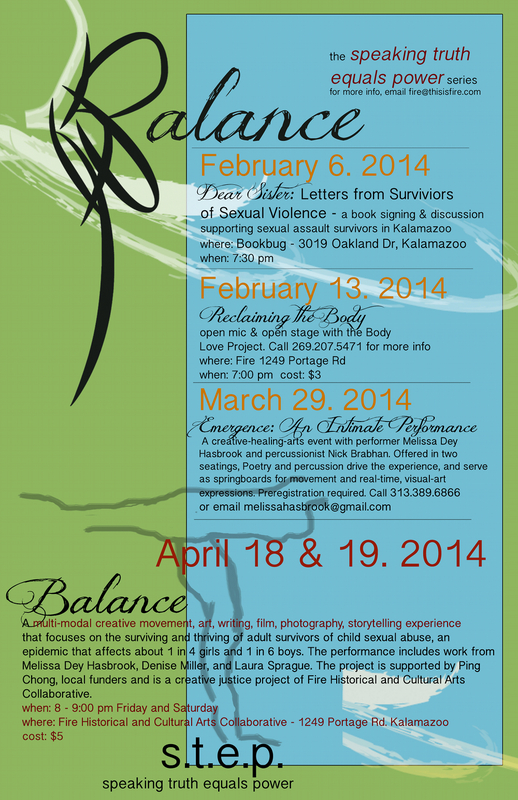 The signing is part of the event series Balance organized by project s.t.e.p. — speaking truth equals power. * I host the monthly Intuitive Arts Drop-In Studio this Saturday, February 8, 12:00pm to 2:00pm, at Lotsa Little Things Gallery, 1305 S. Westnedge, Kalamazoo. BYO set-up or $5 for basic supplies to make mixed-media collage. No experience needed! * Saturday, February 8, in Grand Rapids, I am part of a program also honoring the anthology Dear Sister anthology with the incredibly talented Aaminah Shakur. Today is the last day to register for my workshop “Heart to Art” at 4:00pm at the Arts in Motion Studio. And the performance with signing is at 7:30pm at Have Company, 136 Division Ave., featuring Aaminah and myself — plus an open mic with special guests Mulato VIBES! Like rays of hope the February sun lights fires of creation. Is awaiting its time to bloom. Dear Suzanne, as always, thanks for your inspired words!